If Moses had his choice, which one do you think he would pick? 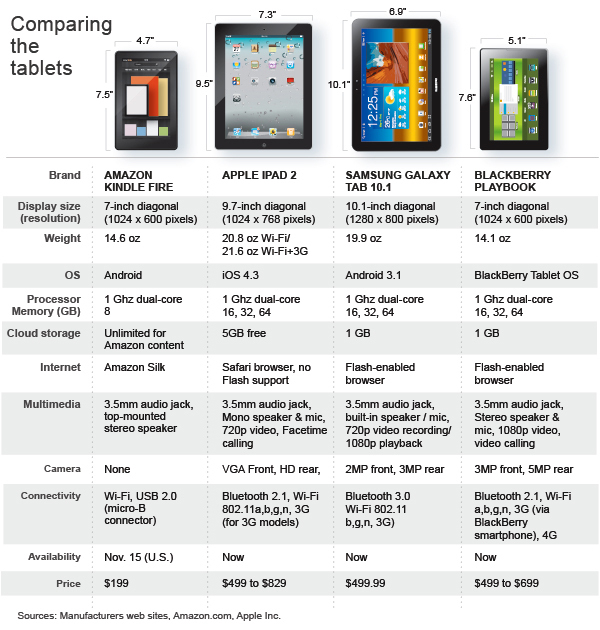 This is chart from Reuters is probably the best comparison table of tablets (or pads, depending on your camp) I've seen. No question some will gravitate one way or another, but with the price-points being about the same, it really comes down to the features needed. While I'm a huge Apple fan (really, you didn't know that?) and would probably lean iPad 2, the Samsung looks pretty nice. Apple will need to play a little catch-up with iPad 3 hardware when it comes out. But, for me, it would come down to the OS. With iOS 5 on the horizon, I think Apple is still way far ahead of the other OS out there. Those are my thoughts... how about yours?